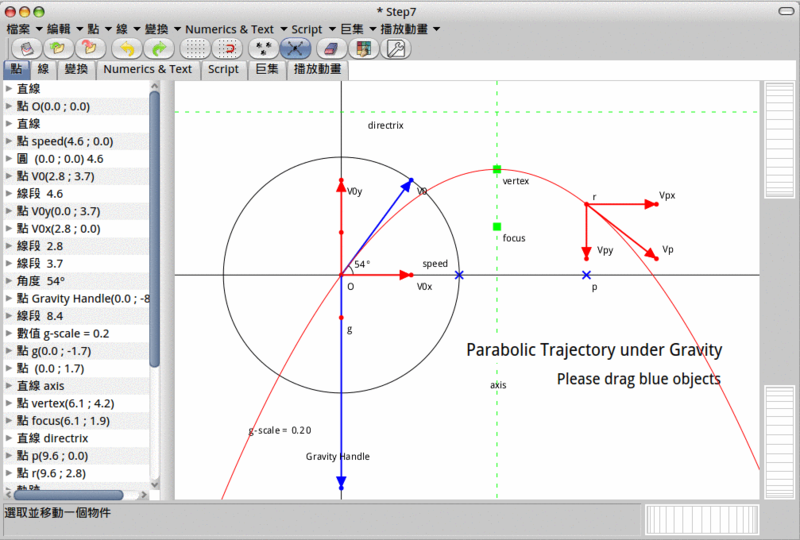 Drawing the Parabolic Trajectory of an Object under Gravity - GNU Dr. Geo, be a geometer! When you throw an object into the air, its trajectory is a parabola. How do its instantaneous velocity and the vertical and horizontal components of the instantaneous velocity change over the course of its trajectory? What happens when the initial speed is larger? Smaller? What happens if the gravity were larger? Smaller? Zero? Negative? Holding gravity and the initial speed constant, in which direction can you throw to make the object reach the farthest point along the horizon?